MiP called for action to tackle bullying and harassment in the NHS and for the extension of maternity rights for parents of premature babies at the Women’s TUC Conference in London on 6-8 March. Women make up nearly 80% of NHS staff – and 60% of managers are women – but only 37% of senior roles in the NHS are held by women, and these figures only become more stark when you look at the representation of BME women. At board level it is barely better, at 40%. To create gender parity on NHS boards, we would need 500 women tomorrow ready to take up seats at the table. If we want women to be the leaders of our NHS and continue to be leaders, the culture of the NHS has to change. Being an NHS manager is a rewarding and important job, but it is also difficult, stressful and isolating, with long and often unpaid overtime hours, unending pressures and a significant amount of bullying and harassment. We need to make these jobs better, for the women who are doing them now and for the women who want to do them in the future. At Managers in Partnership, we strongly believe that managerial staff in the NHS are not part of the problem, but part of the solution to the problem. It is not good enough that in the recent NHS staff survey under one in five said they had been bullied, harassed or abused by a colleague, and that this number has barely improved as Roger Kline has demonstrated in another landmark report, Bullying: the silent epidemic in the NHS. We are committed to standing up for our members on this issue and for all the staff who work in our NHS. We want to see an NHS where no woman is afraid to go to work, and an NHS that takes action. The FDA takes part in TUC conferences as part of the FDA delegation, which this year supported motions on sexual harassment in the workplace, gender inequality in the NHS, professionalisation of the social care workforce and the youth mental health crisis. The conference also agreed to send a motion on period poverty to the 151st Trade Union Congress later this year. 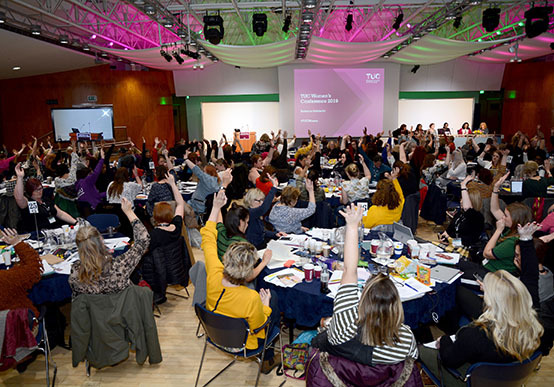 The Women’s TUC Conference takes place every year around International Women’s Day, and is attended by more than two hundred female delegates from across the trade union movement, who propose and amend motions on the issues that matter to women in the workplace.